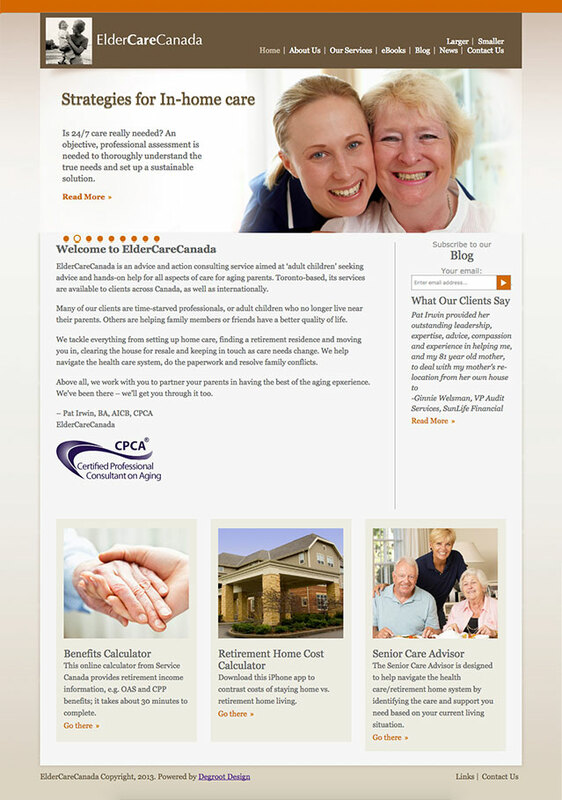 ElderCare Canada is a consulting and implementation service targeted to adult children and their parents. Degroot Design designed the website to elicit feelings of comfort and confidence. Testimonials were included throughout. I recommend Anne de Groot wholeheartedly.I worked with Anne in 2007 on the redesign of my company website. My business is in eldercare, and I needed my old site to be better targeted to adult children, but also accessible to increasingly Internet-savvy seniors. Anne de Groot took the time to understand my business, its targets and its message – which is probably very different than their usual clients. Much of my site was personal, consisting of my family’s care journey with my aging parents, and she very sensitively helped integrate the material I provided and was always receptive to my suggestions. The work was done promptly, well within time and budget, and the site has been met with enormous approval. Since then Anne has continued to support me with minor changes, updates and patient answers to any technical questions.